In order to provide the highest quality and safest care, medical practitioners should have immediate access to clinical decision support. 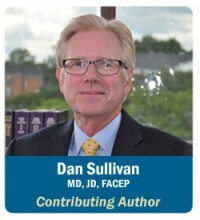 Medicine should not be a memory game; in fact, according to an analysis by Allan Kachalia, MD, JD, published in the Annals of Emergency Medicine, relying solely on memory could leave you more susceptible to cognitive errors that lead to malpractice claims. Kachalia’s closed claims analysis found that cognitive errors were present in 96% of the cases; furthermore, 58% and 41% of the time, those errors were related to gaps in knowledge and lapse in memory, respectively. It is simply not possible to remember all of the information needed to diagnose a patient, such as the factors that predispose to a pulmonary embolism or a subarachnoid hemorrhage; all the elements of the Modified Wells or PERC calculators; all the key tendons and ligaments in the body; all the names of the bones in the ankle and the wrist; or all the cranial nerves and exactly what they do. But these are key data points — risk factors or anatomy that MUST become front of mind at just the correct moment during a particular patient’s workflow to provide appropriate care and avoid error. The absolutely critical point here is that in any clinical shift or day at the office, a physician needs more information about something. We require “knowledge support” in order to make appropriate clinical decisions. If that information is seamlessly and immediately available, the practitioner will use it. If that information is in another room in a textbook or if the practitioner has to leave a current user interface, exit a program, open another program, enter a search term, or look through a list of possibilities, it will not be used. This type of decision support is simply not available inside the commonly used EHRs in today’s marketplace. Although they may claim they provide decision support, careful scrutiny reveals that it is far less than optimal. 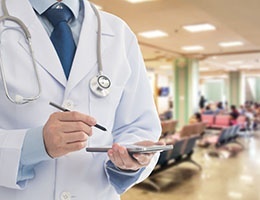 If you had an opportunity to watch a practitioner during a clinical shift or day at the office, you would find her pulling a clinical reference out of her white coat pocket, or walking out of the exam room and into an office to open a textbook, or pulling a cellphone out of a pocket, entering the passcode, and clicking on an icon in a program to access some information. Or the practitioner would minimize the EMR and click on a URL to enter an online program, enter a search term, pick from a list, and then scroll to the required information. The fact is that in the hectic pace of today’s healthcare, these moments are precious; and with the additional time required for the snail’s-pace documentation in the commonly used EHRs, practitioners simply do not acquire the required decision support often enough. If you have to walk down a hallway, put a passcode into a cellphone or leave the EHR user interface, the hurdle to attain support is too high. In today’s world of information technology, why would the practitioner need to do anything but click or touch one button and have all the necessary decision support immediately visible without ever leaving the user interface? The EMR should be SMART enough to know where the practitioner is and what is needed most of the time. The list should not be encyclopedic, but it should follow the 80:20 rule. In most cases, when treating a laceration of the hand, what information is typically necessary? Make those elements immediately available. In a single click, review the relevant anatomy, close it, and continue managing the patient. 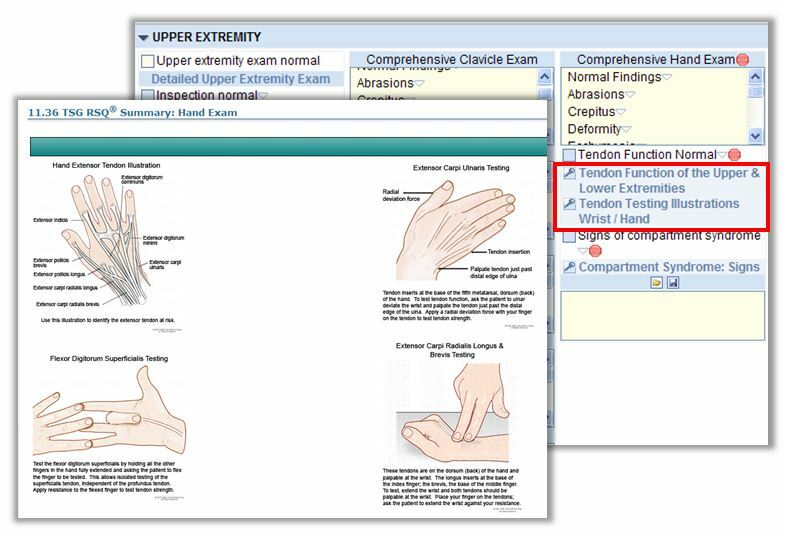 In the example below, the Resources for hand injuries are immediately available without ever leaving the EMR environment (Upper Extremity Injury template from Picis ED PulseCheck® in background). From the chief complaint-specific template, a physician can immediately access the key information they might need to appropriately document “tendon function normal.” In this particular case, we often find that practitioners do not remember all of the tendons on the back of the hand or how to examine them. This is critical information required in managing a laceration in this area and for avoiding a partial or complete tendon laceration. Not surprising, one of the top malpractice lawsuits for extremity laceration claims happens to be failure to diagnose a tendon injury. The bottom line is that decision support is required to provide the highest quality care possible. It should be built into the workflow, it should be immediately available, and the program should be SMART enough to modify available resources based upon user input. Once again, this speaks to the availability of complaint-specific content, or the program can’t know which decision support would be relevant.